HP Yellow #11 Printhead 24K (C4813A) : Disk-O-Tape, Inc.
Get sharp, vibrant color and accurate photo-image quality every time you print. 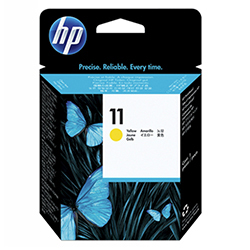 The long-life HP 11 Yellow Printhead works with HP ink cartridges and the printer to make professional results easy and reliable, providing an excellent value. Manufacturer Warranty HP’s inkjet print cartridges, ink cartridges and printheads are warranted to be free from defects in materials and workmanship during the period of the warranty. Page yield footnote Estimated yield based on 5% coverage on 8.5 x 11-inch paper; dependent on printer used.